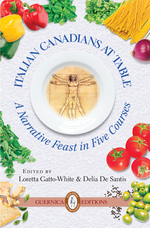 In her review of Italian Canadians at Table: A Narrative Feast in Five Courses, ed. Loretta Gatto-White & Delia De Santis, Candida Martinelli speaks about the purpose and format of the collection, and gives her own insight into the benefits of reading about the food-related memories and lives of others. Italian Canadians at Table was published by Guernica Editions in Fall 2013. The essays in the collection are divided into five sections— Antipasto, Primo, Secondo, Contorno, Dolce,— and take on numerous forms, such as biography, memoir, poetry and song. Martinelli explains that “central to the recollections [in the essays] is that in Italian communities, rapport building has long been based on the gentle gesture of breaking bread.